I had more to say, but I’m late for work. Thanks for posting this. All my favourite blogs are teaming up. I’ve been following Cascio since I saw his Carbon Footprint of a Cheeseburger video… I think via Warren Ellis. I am not an expert on important ideas, but it seems like he has a lot of them. I’ve been watching the TED talks since they started posting them online. It was through them that I first heard of Worldchanging, and then later through Warren Ellis. I distinctly remember the revelatory feeling that came over me as I read through the Worldchanging site, the knowledge that no matter how bad it got, there were smart people thinking of solutions. It’s the perfect antidote to the infantile nihilism or infatuation with Luddite philosophy my peer group is so susceptible to. TED is my absolute fave YouTube channel. Everyone should be watching. Keep an eye on FORA too. “Pessimism is a luxury in good times… In difficult times, pessimism is a self-fulfilling, self-inflicted death sentence.” YES! Lulu are good people. Published my first utterly crappy comic with ’em. p.s. “I don’t truck with zombies.” Hehehehe. Thanks for this post, Mer! Definitely a topic that is near and dear to my heart. Will check out that TED channel as well. 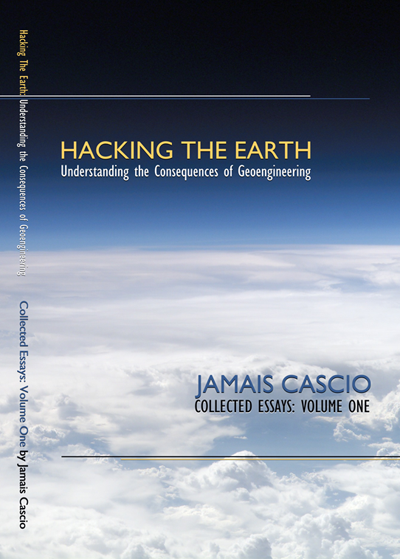 Years ago most video game junkies like myself got a taste for “Hacking The Earth” via SimEarth. The game was one in a long series of “Sim” titles, most famously with SimCity and now The Sims. What made SimEarth a bit different and not particularly well loved was the HEAVY use of science and menu after menu of reading in how the Earth essentially worked on everything from the amount of oxygen in the sky and seas to the effects of having one type of geography over another. It was the best $15 I ever spent! Of course at the time I simply wanted to know how much oxygen was needed to make things spontaneously set ablaze but in time…one learned a thing or three. Fast forward to the topics hit on in the book above and others like it and a weird deja-vu hits. Personally I’m all for it…devastating consequences aside. I mean really we’re already doing this and the military has had its hands in this since forever it seems…so why not open up the game to the brighter players? Worst case scenario we lose Utah in some strange terraforming accident.